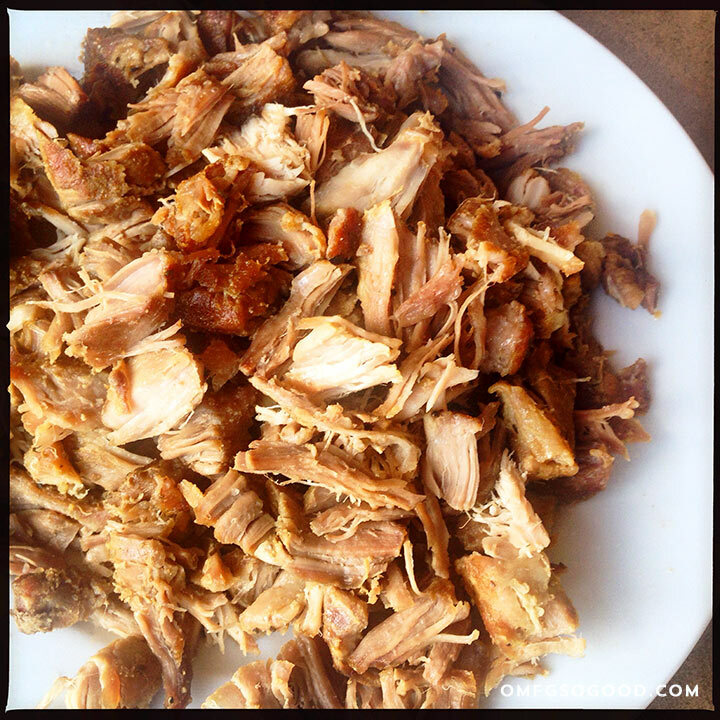 slow roasted pork carnitas | omfg. so good. I, like so many others I know, went into short-term withdrawal when our local Chipotle got hit with the recent carnitas shortage. But, because I’m that kind of gal, I looked at it as an opportunity to perfect my own carnitas recipe so I could make gigantic batches of it and freeze them for future ‘tough times’. So glad I did. This is probably the most versatile, and freezable, recipe I’ve ever developed. To get the best results, be sure to use a cut of pork with nice, heavy marbling. I tend to stick with a simple (in my opinion, perfect) seasoning blend so we can use the finished product for a good variety of meals. 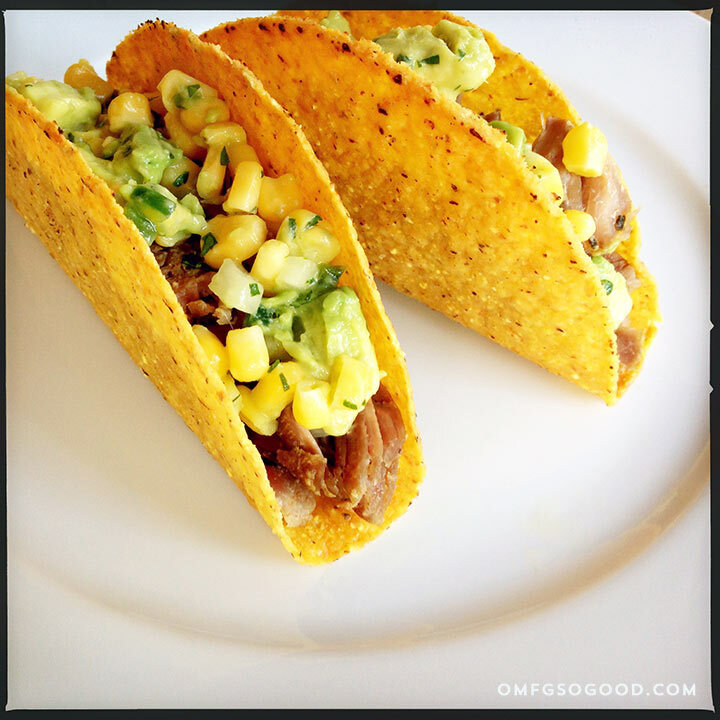 It’s super yum in tacos, topped with corn salsa and a drizzle of crema. Or, served on a bed of chopped crisp greens with chopped avocado and lime juice. If you’re a fan of pulled pork with bbq sauce, it’s even great on a soft, warm potato roll with a side of slaw. OR, just eat it straight outta the oven with a fork. Preheat the oven to 375 degrees. Arrange the ribs in a large baking dish, be sure to give them room. Nobody likes being crowded in a sauna. Am I right? Mix all of the dry seasonings in a small bowl, then sprinkle the mixture evenly over the ribs. Pour the water around the edges of the ribs to create a nice shallow bath for them. Cover the dish tightly with foil, then roast in the preheated oven for 1 hour. Raise the temperature to 450 degrees, and remove the foil. Roast the pork, uncovered, for another 30 minutes, or until all of the liquid has evaporated and only the rendered fat remains. Now, here’s where the carnitas magic happens. Continue roasting for an additional 20 minutes or so, turning the meat with a fork every 5 – 7 minutes, until lightly browned and crispily caramelized. AKA, sheer magic. It’s your carnitas world, chums… I just live in it. Mmmmmm! That looks so good, and it sounds so “do-able”, I must give this a try next time I see the country style ribs on sale….I now have a recipe for my favorite….CARNITAS! I’ll report back once I make this! So delicious! I’ve made it a couple of times now and it doesn’t disappoint! Thanks Jenn!